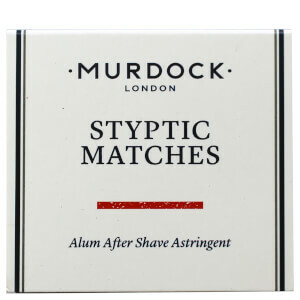 Save 15% + receive a free Murdock London Styptic Matches when you spend £50 on Murdock London. 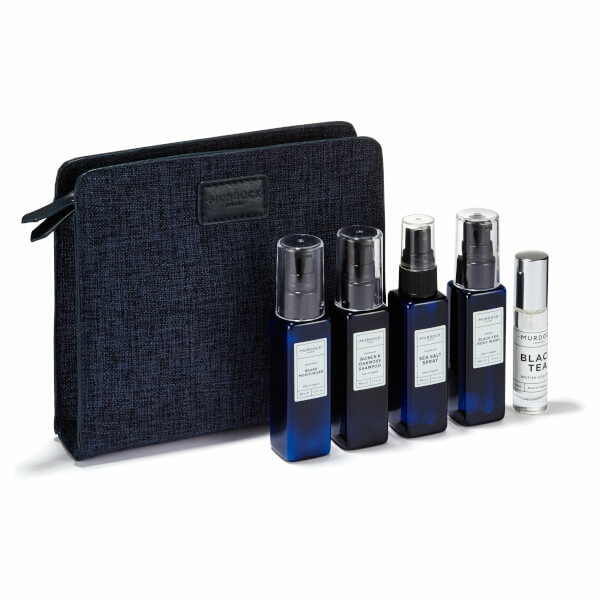 Feel fresh from head to toe with the Murdock London Travel Great Bearded Expectations Gift Set, a set of five travel-sized treats for the face, body and hair. The products are bursting with nourishing ingredients and uplifting scents and housed within a neat travel bag. Free from parabens, phthalates, sulphates, PEGs and synthetic dyes. Keep your facial fuzz in tip-top condition with a lightweight, all-in-one formula that works to soften and condition without greasy residue. Infused with a cocktail of beneficial ingredients, the fast-absorbing lotion nourishes dry, brittle facial hair, whilst caring for the skin beneath it for long-lasting comfort. Expect a well-groomed, healthy-looking beard that feels smooth and hydrated after use. The texturising spray is any barbers’ first step for good style. Enriched with Sea Salt, the styling spray creates body and touchability with a matte finish, allowing you to add definition and shape to your hair. Use alone on wet or dry hair, or with a hair tin for a more defined look. Infused with natural oils and extracts to create a refreshing scent. Refresh and revitalise with a foaming, sulphate-free formula that thoroughly cleanses skin without stripping moisture. Creating a gentle lather upon contact with water, the invigorating shower gel effectively eliminates daily impurities, whilst imparting the brand's signature Black Tea fragrance to rejuvenate the senses with its spicy, woody accords. Skin feels soft and fresh from top to toe. A sulphate-free shampoo that performs a gentle yet effective cleanse on the hair and scalp. Cleansing away dirt and impurities without drying the scalp or follicles, the purifying, regular use shampoo will help to create a healthy scalp environment to promote good hair health. A spicy, woody scent inspired by Britain’s historic spice and tea routes. Opening with Madagascan Cloves, Basil and aromatic Pepper, the masculine fragrance develops into striking Leather accords before settling on a captivating base of Musk, rich Woods and Birch Tar. Moisturiser: Run 2 pumps upwards through facial hair as close to the skin as possible. Suitable for daily use. Spray: Spritz through wet or dry hair before styling. Body Wash: Massage on to wet skin and rinse with warm water. Shampoo: Massage 2 pumps into wet hair and scalp, rinse, follow with conditioner. Moisturiser: Aqua (Water), Cetyl Alcohol, Aloe Barbadensis Leaf Juice, Dimethicone, Helianthus Annuus (Sunflower) Seed Oil, Behentrimonium Chloride, Glycerin, Parfum (Fragrance), Phenoxyethanol, Citric Acid, Isopropyl Alcohol, Tocopheryl Acetate, Guar Hydroxypropyltrimonium Chloride, Sodium Benzoate, Hydrolyzed Wheat Protein, Disodium EDTA, Panthenol, Amyris Balsamifera Bark Oil, Cinnamomum Zeylanicum (Cinnamon) Leaf Oil, Citrus Aurantium Dulcis (Orange) Peel Oil, Copaifera Officinalis (Balsam Copaiba) Oil, Dipterocarpus Turbinatus (Gurjun Balsam) oil , Eucalyptus Globulus Leaf Oil, Juniperus Mexicana (Cedarwood) Oil, Pogostemon Cablin (Patchouli) Leaf Oil, Menthol, Benzyl Benzoate, Linalool, Eugenol, Limonene, Benzyl Cinnamate, Cinnamal. Spray: Aqua (Water), Propanediol, Magnesium Sulfate, Polysorbate 20, Citric Acid, Polyimide-1, Maris Sal, Parfum (Fragrance), VP/VA Copolymer, PVP, Sodium Benzoate, Potassium Sorbate, Citrus Aurantium Dulcis (Sweet Orange) Peel Extract, Citrus Grandis (Grapefruit) Peel Extract, Citrus Medica Limonum (Lemon) Peel Extract, Citrus Nobilis (Mandarin Orange) Fruit Extract, Citrus Aurantium Amara (Bitter Orange) Peel Extract, Coriandrum Sativum (Coriander) Seed Oil, Litsea Cubeba Fruit Oil, Salvia Sclarea (Clary) Extract, Limonene, Linalool, Benzyl Salicylate. Body Wash: Aqua (Water), Sodium Methyl Cocoyl Taurate, Lauryl Glucoside, Sodium Lauroyl Methyl Isethionate, Cocamidopropyl Betaine, Glycerin, Sodium Methyl Oleoyl Taurate, Decyl Glucoside, Sodium Lauroyl Sarcosinate, Parfum (Fragrance), Benzyl Alcohol, Citric Acid, Sodium Chloride, Potassium Sorbate, Trisodium Ethylenediamine Disuccinate, Pogostemon Cablin (Patchouli) Oil, Sodium Benzoate, Sodium Phytate, Citrus Aurantium Bergamia (Bergamot Oil) Extract, Maltodextrin, Artemisia Pallens (Davana) Oil, Cinnamomum Camphora (Camphor Oil), Cinnamomum Camphora Linalooliferum Wood Oil, Citrus Aurantifolia (Lime) Oil, Citrus Medica Limonum (Lemon) Peel Extract, Elettaria Cardamomum (Cardamon) Oil, Eucalyptus Globulus Oil, Eugenia Caryophyllus (Clove) Leaf Oil, Illicium Verum (Aniseed) Oil, Lavandula Hybrida Oil, Myristica Feragrans (Nutmeg) Kernel Oil, Ocimum Basilicum (Basil) Oil, Pelargonium Graveolens (Geranium) Oil, Camellia Sinensis Leaf Extract, Limonene. Shampoo: Aqua (Water), Aloe Barbadensis Leaf Juice, Cocamidopropyl Betaine, Sodium Lauroyl Methyl Isethionate, Sodium Chloride, Sodium Lauroyl Sarcosinate, Lauryl Glucoside, Glycerin, Phenoxyethanol, Hydrolyzed Wheat Protein, Parfum (Fragrance), Trisodium Ethylenediamine Disuccinate, Chlorphenesin, L-Arginine, Sodium Benzoate, Sodium Phytate, Amyris Balsamifera Bark Oil, Cinnamomum Zeylanicum (Cinnamon) Leaf Oil, Citrus Aurantium Dulcis (Orange) Peel Oil, Copaifera Officinalis (Balsam Copaiba) Oil, Dipterocarpus Turbinatus (Gurjun balsam) oil , Eucalyptus Globulus Leaf Oil, Juniperus Mexicana (Cedarwood) Oil, Pogostemon Cablin (Patchouli) Leaf Oil, Polyquaternium-6, Betaine, Sodium Hydroxide, Avena Sativa (Oat) Meal Extract, Potassium Sorbate, Hydroxypropyltrimonium Honey, Benzyl Benzoate, Linalool, Eugenol. Cologne: Alcohol Denat, Parfum (Fragrance), Aqua (Water),Pogostemon Cablin (Patchouli) Oil, Citrus Aurantium Bergamia (Bergamot Oil) Extract, Cinnamomum Camphora Linalooliferum Wood Oil, Citrus Aurantifolia (Lime) Oil, Citrus Medica Limonum (Lemon) Peel Extract, Eucalyptus Globulus Oil, Eugenia Caryophyllus (Clove) Leaf Oil, Illicium Verum (Aniseed) Oil, Lavandula Hybrida Oil, Myristica Feragrans (Nutmeg) Kernel Oil, Ocimum Basilicum (Basil) Oil, Pelargonium Graveolens (Geranium) Oil, Artemisia Pallens (Davana) Oil, Cinnamomum Camphora (Camphor Oil), Elettaria Cardamomum (Cardamon) Oil, Limonene, Linalool, Eugenol, Citronellol, Butylphenyl Methylpropional, Coumarin, Geraniol, Citral.